? June 1892: Alf Singleton and Henry Stewart surprisingly failed to get elected to the committee running Royal Arsenal – the first sign of the split within the club that ultimately led to the formation of professional Woolwich Arsenal and amateur Royal Ordnance Factories as two separate clubs.
? June 1893: In response to the demand for a much higher rent for the Invicta Ground Woolwich Arsenal instead purchased the Manor Field opposite the Invicta as their new ground.
? June 1913: William Hall resigned as a director of Fulham, allowing him to focus full-time on the preparation of the Highbury ground and taking Woolwich Arsenal FC to Islington for the 1913/14 season. 1 June 1953: Alex James died suddenly from cancer on 24th anniversary of his signing. During the war he served in the Royal Artillery, and in 1949 he was invited back to Arsenal to coach the club’s youth sides. He was mentioned in the 1930s song “With Her Head Tucked Underneath Her Arm” by Stanley Holloway. 1 June 1955: Ben Marden was transferred to Watford. Although playing only 42 games for Arsenal these included the last game of the 1952/3 season to win the league and Liverpool 1 Arsenal 5 on 15 November 1952. 1 June 1979: West Bromwich Albion who had just had their best season since winning the league for the one and only time in 1920, decided to sell winger Laurie Cunningham to Real Madrid for £995,000. It caused uproar. The end of football was predicted. 1 June 1999: Moritz Volz joined Arsenal from Schalke. He stayed for five years but never played a league game (but did play two league cup games) before being loaned to Wimbledon and finally transferred to Fulham. 1 June 2001: Lee Conoville transferred to Torquay on a free transfer. He had had a short loan spell with Northampton before playing 112 league games for Torquay, scoring two goals. 1 June 2001: John Lukic retired from football. He is one of just a tiny number of players who have played top flight football across four decades. Others were Peter Shilton, Steve Ogrizovic and Sir Stanley Matthews. 1 June 2002: Sol Campbell, David Seaman and Ashley Cole featured in England’s 1-1 World Cup draw with Sweden. 1 June 2003: Philippe Senderos joined Arsenal from Servette having played 26 games in one season with the club. He went on to play 84 times for Arsenal across four seasons before moving on loan to Milan. 1 June 2007: Gilberto Silva captained Brazil against England, becoming the first and thus far the only Arsenal player ever to captain Brazil. In the last minute of the game Gilberto Silva provided the cross that allowed Brazil to score to make it 1-1. 1 June 2010: Aaron Ramsey signed a new long term contract having signed for Arsenal in 2008 and having made 27 league appearances in his first two seasons. 1 June 2010: Silvestre and Gallas left Arsenal at the end of their contracts. Silvestre moved on to Werder Bremen while Gallas went on to play for Tottenham Hotspur. 2 June 1891: The International Football Association Board (which at the time was the FAs of England, Scotland, Wales and Ireland approved the notion of awarding a penalty for fouls close to the goal. 2 June 1908: James Quayle signed for Arsenal for a second time before receiving an offer from Northfleet where he played for two seasons before turning professional and rejoining Woolwich Arsenal. He made just one appearance for Arsenal on 12 November 1910 but was badly injured and did not play football again. 2 June 1934: Wilf Copping joined Arsenal from Leeds United for whom he had played 162 games. He stayed at Arsenal until 1939 whereupon he returned to Leeds. 2 June 1936: The League announced that Arsenal should pay a £250 fine for playing weakened teams throughout the run up to the FA Cup Final. But giving the earnings from the FA Cup final the accountants probably thought it had however been worth it. 2 June 1937: Reg Lewis played his third game in a row in which he scored, in 3-0 win over Copenhagen. He was one of the few players who played for Arsenal either side of the war, and managed 103 goals in 154 league games. For the tour see here. 2 June 1968: Last appearance for Jim Furnell as David Jenkins scored a hattrick in a friendly in Kuala Lumpar. 2 June 1985: As a result of the attack by Liverpool fans on Juventus fans at the Heysel stadium Uefa banned English clubs from playing in Europe. The ban prohibited Arsenal from playing in the Uefa Cup in 1988 and 1991 even though Arsenal fans had not been involved in any European crowd trouble. 2 June 1991: Gus Caesar moved to Cambridge United on a free transfer but did not play for the club. He soon moved on to Bristol City, but it was not until he reached Airdrieonians and then Colchester Utd that he showed the form that George Graham suspected he could maintain. 2 June 2002: Campbell, Seaman and Cole play for England in a World Cup game against Sweden. 2 June 2005: Ashley Cole was fined £100,000 for having illegal talks with Chelsea. He claimed he had done so because he was made to feel physically sick by the lowness of Arsenal’s offer in its contract discussions with the player. 3 June 1912: At the AGM of the Football League William Hall applied to be a director of the League. He didn’t get elected but gained the highest number of votes of those not elected. Thus when Tom Houghton of Preston North End died in September Hall gained a place on the Football League board, and was the first Arsenal man and the only man from the south of England to do so for over 25 years. 3 June 1931: Jack, Lambert and Bastin scored in a 3-2 win over Gothenburg. Final senior appearance of Jimmy Brain, In September 1931 he moved to Tottenham for a transfer fee of £2,500. He played 47 games for Tottenham and scored 10. 3 June 1939 Jimmy Logie signed from Lochore Welfare. He served in the Royal Navy through the war before returning to Arsenal with whom he won the league twice. 3 June 1939: The Military Training Act came into force. It re-introduced conscription for all men aged 20 and 21. Six months military training was now compulsory. 3 June 1970: Bobby Gould transferred to Wolverhampton. In all he played for ten clubs, and the 65 league games he had with Arsenal was only beaten by the 82 he had for Coventry. 3 June 1997: One day before his birthday Alex Manninger joined Arsenal from Grazer AK, to become understudy to David Seaman. Seaman was injured in Manninger’s first season giving him the chance to play six games in a row without conceding. 3 June 2000: The song “Arsenal number 1″ entered the top 50 for one week. 3 June 2003: David Seaman was transferred to Manchester City. (Quoted in some sources as 4 June), after 405 games for Arsenal. He stayed one season at Man City and played 19 league games before retiring after 731 games. 3 June 2008: Jens Lehmann, the only player to play in every game of the Unbeaten Season, transferred to VfB Stuttgart. 3 June 2010: Philip Roberts signed from Norwich City where he had been a youth player. He was quickly loaned to Inverness and then transferred to Falkirk without playing a league match for Arsenal. 4 June 1902: Joseph Williams born in Rotherham on 4 June 1902, He started playing for Rotherham County and in September 1929 moved to Arsenal making his Arsenal debut in the 5–2 defeat by Aston Villa on 25 September 1929. 4 June 1915: Henry Norris launched a recruitment campaign in the West London and Fulham Times gathering men for the new 177th (Fulham) Royal Field Artillery Brigade. In all Norris was responsible for raising three separate brigades in this way. 4 June 1917: Henry Norris was knighted in the birthday honours list in recognition of his unstinting work in evolving the idea for and then raising the first footballers battalion. Other such battalion’s followed. 4 June 1920: In a seemingly unique event, Sir Henry Norris spoke about his source of income, this being rents from property he owned, and rented out, in Fulham. 4 June 1925: Herbert Chapman returned to England early from a tour with Huddersfield, ready for talks with Arsenal about becoming the club’s new manager. 4 June 1939: Dave Nelson and George Drury scored two each in friendly win against the wonderfully named Diables Rouges in Brussels. 4 June 1977: Alex Manninger born in Salzburg. He first played for SV Austria Salzburg, moving into their first team squad in 1995 and came to Arsenal in 1997. 4 June 1977: Scotland beat England at Wembley, with Scots outnumbering English fans 10 to 1, in a match remembered for the pitch invasion at the end. The inadequacy of ticketing and safety measures were on show for all to see, but the FA remained in total denial. 4 June 1983: Emmanuel Eboué born in Abidjan. He started his career at ASEC Mimosas Academy before moving to KSK Beveren in 2002. .
4 June 1985: Lukas Podolski was born in Gliwice. He joined 1 FC Köln in 1995 where he broke into the first team in 2003 and made 81 appearances for the club before moving to Bayern Munich. 4 June 1992: David O’Leary played for Ireland in a 2-0 defeat by Italy. 4 June 1997: Gilles Grimandi signed by Arsenal from AS Monaco for £1.75m. When his playing days were over he became the chief scout in France for Arsenal and also appeared for the Arsenal Legends team occasionally. 4 June 1996: Cliff Holton died. He retired from football in 1968, and took up a new career in engineering. Soon after his retirement from that career he died suddenly while on holiday, at the age of 67. 4 June 2008: Bac Sagna signed a new long term contract. It turned out to be his last, and at the end of the contract in 2014 he rejected a new deal with Arsenal and instead moved on a free transfer to Manchester City. 5 June 1903: Fred Dwight signed. He played for Chesham Town from 1899 until 1901 when he moved to Fulham, and then after a further two years moved on to Woolwich Arsenal in 1903. 5 June 1914: All Saints Church Dreadsall in Derbyshire was gutted by fire, the cause blamed on a suffragette arson attack. 5 June 1919: A black man was stoned to death by a mob and race riots involving an estimated 10,000 men roaming the streets looking for and attacking black men took place. The police, rioters, and the media all blamed West Indian men for the trouble. The courts however blamed the obvious culprits: white mobs. Liverpool council and police force drew up a plan to house all black citizens in compounds and then repatriate them. 5 June 1922: An interview with Sir Henry Norris appeared in the prestigious football journal, Athletic News which raised the question of transfer fees which were once more on the rise. Sir Henry wanted them controlled but player wages liberated. The former of course never happened. 5 June 1991: Kwame Ampadu sold to WBA. He had played just twice for Arsenal, but went on to have another 16 years in football including playing four times for Ireland. He then returned to Arsenal as an Academy coach. 5 June 1999: Keown, Seaman and Parlour played for England v Sweden in a world cup qualifier. It ended 0-0. 5 June 2013 It was announced that Arsenal’s record signing, Andrey Arshavin, would be released on 30 June 2013. He returned to Zenit St Petersburg and played on to the end of the 2014/5 season. 6 June 1891: Alf Singleton (who went on to become a leader of the 1893 split of the club) was elected top of the poll to the Committee of RAFC. One year later, as a result of his expression of his views on the future of the club, he lost his place, coming bottom of the poll. 6 June 1903: At the meeting which created Fulham Football and Athletic Club Company Limited, Henry Norris was elected the company’s first chairman. He took up the reigns at Arsenal in 1910, but did not break with Fulham until after the first world war following a dispute over the post-war cup match between Fulham and Arsenal. 6 June 1906: Archie Low was transferred from Ashfield in Glasgow. He only went on to play three games for Arsenal before moving back to Scotland. 6 June 1910: At a meeting in Rotherhithe, the supporters committee set up to rescue Arsenal resolved not to hand over any of the money it had raised to Henry Norris and William Hall, pending further developments, but instead they applied for shares in the new limited company set up to rescue Arsenal. 6 June 1930: John Butler (the man who played for Arsenal at the heart of their “WM” tactical revolution in 1925) was sold to Torquay United. 6 June 1937: Final game (v Feyenoord) of Alex James, arguably our greatest ever player. He played 231 league games as an inside forward scoring 26 goals. He later became a youth coach but died of cancer aged 51. 6 June 1985: Fifa extended Uefa’s ban on English clubs in Europe to a worldwide ban lasting an indefinite amount of time but excluded from the ban the England national team. 6 June 1990: Gavin Andrew Hoyte was born. He signed for Arsenal aged nine, and became captain of the under 18 and the reserve teams. However he only played one senior league game for the club. 6 June 2002: Henry, Vieira and Wiltord all played for France in a World Cup game against Uruguay. The score was 0-0 but Henry was given a red card on 25 minutes. 6 June 2014: Elias Chatzitheodoridis, a defender, joined Arsenal from Mas Kallitheakos for an undisclosed fee. 7 June 1915: The Football League opened its enquiry into the Manchester Utd 2 Liverpool 0 match; the second match involving Liverpool in which match fixing was alleged. 7 June 1917: The British army detonated 19 ammonal mines (an alternative to TNT) which had been placed under the German lines. 10,000 enemy soldiers were killed in what is said to have been the deadliest deliberate non-nuclear man-made explosion in history. 7 June 1922: This was the moment when Sir Henry Norris began to split completely from his political work in Fulham, telling his party he would engage with them no more. 7 June 1928: After two years at Arsenal, Jack Lee was sold to Chesterfield for £250. 7 June 1941: Tim Rogers played in a wartime international for Wales against England. England won 3-2. 7 June 1947: Arsenal lost 1-2 to Sheffield United away in the final league match of the season – the only time AFC have played a league match in June. The season was extended because of the number of postponements due to the exceptionally bad winter weather. 7 June 1948: Alf Morgan (also known as Stan Morgan) was transferred from Arsenal to Walsall. He was on Arsenal’s books for 1946 to 1948 but played just twice in the league. 7 June 2013: David Bentley once of Arsenal, and who had pushed for a transfer in order to get the games he felt he deserved, was released by Tottenham, and heard of no more in football. He then set up his own restaurant. 8 June 1905: Jimmy Sharp signed for Woolwich Arsenal from Fulham, then of the Southern League. He had won a runners-up medal with Dundee, and Scottish caps before moving on to play for Arsenal. 8 June 1910: Henry Norris, Arsenal’s new owner, told manager George Morrell that his job was safe despite missing relegation by just one place and two points in the season just finished. For all the events of this period see here. 8 June 1914: Frank Bradshaw signed from Everton. In 1907, he played in Wednesday’s FA Cup winning team and got an England cap before moving to Northampton, and then Everton for whom he played 66 times. 8 June 1925: The Football League voted to change the offside rule to two men behind the ball rather than three, leading to Chapman’s variant “WM” formation in his first year at Arsenal. The tactic helped Arsenal come second in 1925/6. For the momentous events of this summer which changed Arsenal forever see here. 8 June 1936: Arsenal fined £250 for fielding weakened teams in order to protect their FA Cup squad (which won the cup the previous April). For the story of the summer of 1936 see here. 8 June 1954: Lionel Smith sold to Watford. Although a regular in the title winning 1952/3 team he only played ten games in 1953/4 and left on a free transfer. He played just seven times for Watford before moving onto Gravesend. 8 June 1982: Tony Woodcock signed from Cologne. He had been in Germany for three seasons, scoring 28 goals in 81 games. 8 June 1995: Bruce Rioch appointed manager of Arsenal from Bolton. In 1994/5 Bolton were losing League Cup finalists, and beat Reading in the Division One play off. It is said Bolton supporters think of him as one of their best managers. 8 June 2010: Philippe Senderos joined Fulham from Arsenal on a free. He played 57 times for them before moving on to Valencia and then in 2014, Aston Villa. 8 June 2011: Carl Jenkinson signed for £1m. He showed great promise and was loaned to West Ham for 2014/15 where he became a regular with the side. 9 June 1928: Jack Lee who had won the London Combination with Arsenal transferred to Chesterfield. He had come from Horndon Athletic and played just seven times in the 1926/7 season for Arsenal as outside left before moving on. 9 June 1984: John “Alex” Mackie died. He played for Portsmouth in two cup finals after leaving Arsenal, and later for Northampton, and Sittingbourne before retiring from football at the outbreak of war. 9 June 1986: Martin Keown sold to Aston Villa after George Graham decided that Keown was not good enough to play for Arsenal. 9 June 1993: Dixon and Wright played for England in their defeat by 2-0 to the USA in the US Cup. 9 June 1999: Fabián Caballero, who had been on loan to Arsenal from Cerro Porteño returned to his club before moving on to Sol de América He only played one league game for Arsenal, but in 2000 returned to the UK to play over 100 games for Dundee. 9 June 1999: Remi Garde announced his retirement. He went into management and later became manager of Lyon and subsequently Aston Villa. 9 June 2008: Alex Song signed new long term contract. He continued at Arsenal, but amidst rumours of a dispute with the management he was sold to Barcelona in 2012 having played 160 league games for Arsenal. 9 June 2008: Gary Lewin agreed to leave Arsenal as the head of their medical team to take up a place with the FA on 1 August. His cousin Colin Lewis took over at Arsenal. 10 June 1910: Local press reports in SE London confirmed that Henry Norris was willing to sell his Woolwich Arsenal shares to local people. But it was also confirmed that the last share issue itself had failed. 10 June 1919: Dr Kevin O’Flanagan born – he played for Arsenal in 1946/7. He also played for Ireland at both football and rugby, was also a sprint champion, and played football for both N Ireland and the Irish Free State. 10 June 1921: The UK reached crisis point with 2.2 million unemployed, 2 million involved in wage disputes and 100 days of drought. 10 June 1925: Having returned early from Huddersfield’s tour Herbert Chapman met with directors of Huddersfield prior to agreeing to manage Arsenal. 10 June 1936: Arsenal released Frank Hill and Ehud Rogers. Hill moved on to Blackpool after playing 76 league games. Rogers had signed for Arsenal in 1934, making 16 league appearances and scoring 5 goals and moved on to Newcastle. 10 June 1945: Tommy Baldwin born. Some sources quote 1946. He played first for Wrekenton Juniors before joining Arsenal. He turned professional in 1962, and made his league debut in the 3–0 defeat of Birmingham City in April 1965. 10 June 1966: David Platt born. He was an apprentice at Man U before moving on to Crewe and then Aston Villa. After that he played in Italy before joining Arsenal from Sampdoria. 10 June 1984: Almost unimaginably, given the state of their relative teams, England beat Brazil 2-0 in Rio with Sansom and Woodcock in the side. 10 June 1985: Brian Talbot sold to Watford after 254 league games and 40 league goals for Arsenal. After that he moved on to Stoke, WBA, Fulham and Aldershot before playing finally for Sudbury Town, and then moving into management. 10 June 1993: Archie Macauley died. After a playing career which earned him numerous plaudits he had a very successful managerial career with Norwich, WBA and Brighton, but then, aged 50, having just taken Brighton up, he gave it all up and is said to have become a traffic warden. 10 June 2009: George Eastham finally presented with his World Cup medal. As a squad member who did not play in the 1966 World Cup Final he had not been granted a medal – but finally got one 43 years later. 10 June 2013: On this birthday (see above) Park Chu Young, on loan to Celta Vigo, was fined for failing to turn up at a match. He then went on loan to Watford, for whom he played two games, before being sold to Al Shabab. 10 June 2015: Josh Vickers’ released by Arsenal. Two months later he signed for Swansea City. 11 June 1920: The third reading in Parliament of Sir Henry Norris’ anti-gambling legislation. Bookmakers would hand out coupons for punters to complete. At one Liverpool match in 1915 138,500 coupons were handed out and 79,000 were returned with money. With Liverpool players found guilty of match fixing it was felt it was time to act. 11 June 1925: Herbert Chapman became the manager of Arsenal, replacing Leslie Knighton who had been manager since the resumption of football after the first world war. Chapman went on to become the manager who gave Arsenal its first Championships, and its first FA Cup triumph before his untimely death. 11 June 2002: Despite Vieira and Wiltord playing, World Cup holders France went out of the competition to Denmark in South Korea. 11 June 2009: Arsenal opened an Arsenal shop in Bahrain as part of the deal with Emirates Airlines. 11 June 2012: Sylvain Wiltord retired from football. In 2015, he competed on the reality show Dropped, which puts sportspeople in inhospitable environments. The day after his elimination from the programme, three contestants died in a helicopter collision. Wiltord played 104 league games for Arsenal and 526 league games all told. 12 June 1945: Pat Jennings born. In his early years he played for Shamrock Rovers and Newry Unite, and had a spell playing Gaelic football before joining Watford in 1963. 12 June 1946: Bobby Gould born. He started his career with Coventry, making his debut for them at the age of 16, before joining Arsenal in 1968. In all he played for nine and managed 11 clubs. 12 June 1951: Final appearance for Ian McPherson. He played 152 games for Arsenal before moving back to Notts County – the club from which he had been signed in 1946. He was a regular in the championship team of 1948. 12 June 1974: Death of Peter Dougall who played 21 league games for Arsenal in the 1930s. 12 June 1977: Even a full-back pairing of Rice and Nelson could not stop N Ireland being beaten by Iceland 2-0 in the World Cup. 12 June 1980: Clive Allen was signed by Arsenal from QPR in one of the strangest transfers ever. He never played for Arsenal in the league (although he played in three pre-season friendlies) and moved to Crystal Palace in a swap deal for Kenny Sansom before the season began. 12 June 1998. Emmanuel Petit played for France in their opening world cup game. He played 63 times for France and scored three goals including one in the world cup final. 12 June 2001: Nelson Vivas moved to Inter on a free transfer. He played 69 times for Arsenal scoring one goal, moving first to Celta de Vigo on loan before moving on to Italy. 12 June 2008: Derek Tapscott died. After retiring from playing football he worked in the sporting goods business until retiring in 1997. He also wrote an autobiography, Tappy. 12 June 2009: Fabianski signed a four year contract with Arsenal which ended with him lifting the FA Cup. He then moved on a free transfer to Swansea having refused to sign a new contract with Arsenal. 13 June 1910: Woolwich Arsenal came to within five minutes of extinction at the AGM of the Football League, as the League executive turned down the idea of Arsenal merging with Fulham and playing in the first division. See also here; and again here. For a detailed account of the month’s proceedings see here. 13 June 1917: Henry Norris attended Buckingham Palace to be knighted by King George V in the midst of the first ever daytime bombing raid over London! 13 June 1966: Billy Wright finally resigned. He was the first Arsenal manager since Chapman who was appointed to the club without having had a previous link with Arsenal and was by and large an unmitigated disaster. 13 June 1980: Having signed the day before, Clive Allen at the age of 19 was now heralded as the most expensive teenager in Europe in joining Arsenal from Queens Park Rangers for £1,250,000 deal. 13 June 1983: John Devine joined Norwich on a free transfer having been out of the side with a long-term injury. He had played 112 league games for Arsenal and continued playing for another eight years. 13 June 1985: Fifa’s ban on all English teams playing overseas following the Heysel riot. This was subsequently modified to allow friendly matches by English teams. 13 June 1988: Steve Bould signed for Arsenal for £390,000. He had played 183 games for Stoke City and nine on loan with Torquay. Both Arsenal and Everton made offers. He made the right choice. 13 June 2008: Aaron Ramsey signed from Cardiff. Both Man U and Arsenal bid for him, but he chose Arsenal undoubtedly in part because of the connection between Arsenal and Cardiff via Terry Burton. 13 June 2014: After rejecting the offer of a new contract Bacary Sagna moved to Manchester City on a free transfer. He had played 213 league games for Arsenal in a seven year spell, but made only a handful of appearances for Man C.
13 June 2014: It was said in some sources that Arsenal sold Chelsea their rights to the re-signing of Cesc Fabregas to Chelsea for approx £5.6m. Arsene Wenger later reported that he had no contact with Fabregas at this time. 14 June 1912: Andy Ducat was sold to Aston Villa. He was Arsenal’s one great player at the time, and was still only 26. He had remained loyal to the club through all its troubles and had played 175 league games for Arsenal. 14 June 1920: Athletic News magazine gave fulsome praise to Sir Henry Norris for his work on steering the anti-gambling bill through the Commons. It now moved onto the Lords where their Lordships who were fond of a flutter on the horses did all they could to hold the bill up. However it did eventually pass. 14 June 1973: David O’Leary signed for Arsenal. He went on to become Arsenal’s all time record holder for first team appearances. He stayed for 20 years whereupon he transferred to Leeds. 14 June 1973: Peter Storey made his 19th and last appearance for England. He also played twice for England Schoolboys and twice for the Football League. 14 June 1974: Ian Selley born. He joined Arsenal in 1990 as a trainee and won the SE Counties League and the Floodlit Cup winners’ medal in his first season. 14 June 1990: John Lukic left Arsenal for Leeds for £1m. He played 265 league games for Leeds before returning to Arsenal in 1996 where he remained as backup keeper until 2001. 14 June 1993: Eddie McGoldrick joined Arsenal from Crystal Palace. In all he played 57 times for Arsenal and scored one goal, before moving on to Man City, after a loan spell. 14 June 1997: Luis Boa Morte signed from Sporting CP to Arsenal for £1.75m. The press were very critical of Arsenal’s signing of overseas players and in reporting the move the Daily Telegraph sarcastically said of Luis Boa Morte he was “apparently just one player, not three”. 14 June 2001: Francis Jeffers signed by Arsenal for £10m from Everton. His transfer was not a success and in 2003 he was loaned back to Everton. In all he had 12 clubs but never played more than 55 games with any of them. 14 June 2013: Denilson transferred to São Paulo who gave him a four year contract, after he had played 96 times for Arsenal, followed by a loan spell to the Brazilian club. 14 June 2014: Sir Chips Keswick announced as Arsenal’s new chairman, replacing Denis Hill-Wood who had been chair from 1962 to 1982. Denis Hill-Wood was the third generation of his family to serve as chairman of Arsenal going back to his grandfather, Samuel Hill-Wood. 15 June 1899: George Leavey elected chair of Woolwich Arsenal. Although his business appeared to be a modest gentleman’s outfitters in Plumstead he contrived to be a major source of revenue for the club during its early days. 15 June 1910: Woolwich Arsenal factories started to lay off men due to a long-term downturn in work following the end of the Boer War – spelling catastrophe for Woolwich Arsenal FC which depended on a vibrant workforce to boost its attendance figures. 15 June 1912: Andy Ducat sold confirming the club’s policy of selling off its best players in order to try and balance the books. The policy led directly to relegation the following season with the worst Arsenal record of all time. 15 June 1919: John Alcock and Arthur Whitten Brown completed the first nonstop transatlantic flight. (They took off on 14 June). 15 June 1925: Arsenal announced that the club had bought the Highbury stadium, and some additional land around it, and that the lease of the site had ended. Sir Henry Norris’ huge gamble in taking the ground on a full-repairing lease had paid off. 15 June 1929: England played a tour of Australia, which included Tom Whittaker and Joey Williams. Joey played 22 games for Arsenal but only two on this tour, despite travelling across the world by sea. 15 June 1935: Arsenal signed Jackie Milne for a fee reputed to have been £5000. He played 49 league games and scored 19 goals. 15 June 1935: Ray Swallow born. Aside from playing 13 times for Arsenal he also played 38 first class cricket matches for Derbyshire. 15 June 1974: Trevor Ross signed as a professional. He played 58 times for Arsenal before moving on to Everton. He later became a non-league manager before becoming an HGV driver. 15 June 1995: Bruce Rioch became Arsenal manager and simultaneously Stewart Houston resigned from his post as temporary manager. Rioch lasted just one season and managed a European slot on the final day of the season, before being sacked. 16 June 1917: The local newspaper in Fulham started a long running series of attacks on the Borough’s mayor, Henry Norris following the flooding of local sewers caused by a lack of repair (itself caused by a lack of manpower to carry out the repairs). The campaign continued for a staggering six years. 16 June 1934: Margate became Arsenal’s feeder club. With the school leaving age of 14 but league clubs prohibited from signing players until 17 the nursery idea allowed Arsenal to train youngsters as amateurs and monitor their development. 16 June 1982: Graham Rix and Kenny Sansom became the first Arsenal players to play for England in the final stages of the World Cup. 16 June 1986: Danny Clapton died aged just 51. He moved to Luton Town in September 1962 and lived (and for a while played football) in Sydney from 1963 to 1970 before returning to London to run a public house in Hackney. 16 June 1994: Lee Harper signed from Sittingbourne. He only played once for Arsenal before moving on to QPR. In his career he played over 100 times each for QPR, Northampton and Kettering. 16 June 2000: Lauren signed from Real Mallorca. He had already played for four pro clubs by the time he joined Arsenal, but it was Arsenal where he made his real mark, playing 159 league games. 17 June 1895: William Blyth, the man who became Arsenal’s first film star, and first cup final captain, was born. See also here. 17 June 1910: Henry Norris made it clear that he thought Arsenal deserved more support, and that although he and Hall had done their bit, there was nothing more they could do. He stated that if people thought he was not the right person to take the club forward, all they had to do was to indicate by 17 June 1910 that they wanted to take over, and he would leave. 17 June 1919: Canadian troops, who had been getting restless after their return to their homeland had been repeatedly delayed became angry at the arrest of two of their number, attacked Epsom police station and killed a police officer. All told about 400 soldiers were involved and a lot of property in Epsom was destroyed. 17 June 1922: Bob John signed from Barry Town. He was perhaps Leslie Knighton’s best signing for Arsenal and went on to play 421 times for the club. For details of the player see here. 17 June 1952: Gerry Ward signed as an amateur. He turned pro the next season but then had to do his national service, and so lost a lot of football time to square bashing. But he finally went on to play 81 times for the club. 17 June 1953: Ray Daniel sold to Sunderland. Ray played 87 league games, taking over at centre half from Leslie Compton and played every match save one in the 1953 league triumph. 17 June 1997: Marc Overmars, Emmanuel Petit, and Alberto Mendez were signed in one day! For their first game together see here. Mendez was discovered playing for German non-league side 1 SC Feucht but only played four times for Arsenal. 17 June 2010: Kyle Ebecilio signed from Feyenoord on a free transfer as a youth player. He never played for Arsenal, and despite being offered a new contract in 2013 he chose to move on to FC Twente. 17 June 2013: Geoff Strong died. He retired from football in the summer of 1972 and ran a hotel-furnishing company and co-owned a pub. 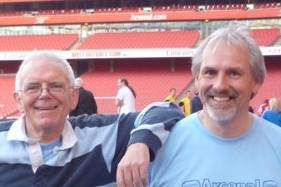 In later life he suffered from Alzheimer’s disease, but continued to be seen at Anfield, where he played after leaving Arsenal, but maintained no connection with Arsenal. 18 June 1914: George Jobey sold to Bradford PA. He had won a league winners’ medal with Newcastle and was the first Arsenal player to score at Highbury as well as being the first player to be stretchered off at Highbury. He later went into management. For broader context see here. 18 June 1921: “The Football and Sports Favourite” magazine carried an interview with Leslie Knighton which in its best interpretation might be called eccentric, but is probably best called utterly bizarre. 18 June 1962: Andy Linighan born in Hartlepool – both his brothers were also footballers. He started with Hartlepool, then moved through Leeds, Oldham and Norwich before coming to Arsenal. 18 June 1979 Paul Davis signed professional forms for Arsenal having signed as an apprentice in 1977. He made his debut in 1980 and played 447 league games for the club. 18 June 1993: Eddie McGoldrick signed for Arsenal for approx £1m, playing his first game in the charity shield against Man U on 7 August 1993. 19 June 1913: Wally Hardinge joined from Sheffield United. He was a first class cricketer scoring 33,519 runs and playing in one test match. He played the two pre-war seasons at Highbury and the first post-war season and retired in 1921. 19 June 1921: The annual census was undertaken in Britain. For the first time individuals in a household could make separate confidential returns if they wished rather than have the “head of the household” answer for everyone. 19 June 1933: Len Julians born. His first club was Walthamstow Avenue, followed by Leyton Orient whom he joined in 1955. After 66 games and 35 goals, it was not surprising that Arsenal would come knocking. 19 June 1944: Death of Herbert Roberts aged just 39. He worked as a trainer for Arsenal’s reserves and then joined the Royal Fusiliers in the war. He died while on active service and was buried at Southgate Cemetery. 19 June 1998: David Grodin signed from AS Saint-Étienne. He only played one league game with Arsenal and went on a series of loans before being sold to the last of these: Dunfermline. 19 June 2001: Gio van Bronckhorst signed from Rangers for £8.5m. He played 42 games for Arsenal before going on loan then permanently to Barcelona. He ended his playing career with Feyenoord with whom he then moved into management. 19 June 2007: Jeremie Aliadiere sold to Middlesbrough for £2m. He played 78 times for them before moving on to Lorient. In 2014 he moved onto the Qatari side Umm Salal. 19 June 2009: Thomas Vermaelen signed from Ajax. He went on to play 110 league games for Arsenal and became club captain, but then injuries struck and after the 2014 Cup victory (for which he was an unused sub) he moved to Barcelona. 20 June 1900: Jim Ashcroft signed from Gravesend Utd. He played 273 games for Arsenal and was a member of the promotion winning side in 1904. He also made three appearances for England in 1906. 20 June 1949: Ronnie Rooke transferred to Crystal Palace to become player-manager. After Palace Ronnie became player manager of Bedford Town, and later worked as a porter at Luton Airport, dying of lung cancer in 1985 aged 73. 20 June 1966: Bertie Mee became Arsenal manager. After the experience of taking a very high profile ex-footballer as manager, Arsenal sought to repeat the success of Tom Whittaker by promoting their physiotherapist. 20 June 1984: Dave Madden was transferred to Charlton after making just two league appearances. His career subsequently took him to Los Angeles, Reading, Crystal Palace and Maidstone. 20 June 1987: Ian Allinson released to Stoke City. After further moves to Luton and Colchester, Ian has subsequently had a career managing in non-league football, including notably at Boreham Wood, where his connection with Arsenal continued. 20 June 1987: Frank Boulton died. Having left Arsenal he played for Derby in 1938/9 but missed out on their Cup Final appearance due to injury. He played for Swindon Town from 1946 to 1950 before moving on to Crystal Palace and then Bedford Town. 20 June 1989: Goalkeeper Andrew Marriott sold to Nottingham Forest. He never played a league match for Arsenal, but between 1989 and 2011 he played for 17 clubs, with Wrexham (255 games) being his one long term playing engagement. He has since become part of the McLaren Formula 1 team and worked with WBA. 20 June 2007: Scarborough FC went out of business with debts of £2.5m. The club was formed 7 years before Arsenal and the clubs met on January 1993 with the result Scarborough Town 0 Arsenal 1. It was Cup Match 6 of Arsenal’s Cup Double season, in the fourth round of the League Cup. 20 June 2008: Gaël Clichy signed a new long term contract and went on to play 187 times for Arsenal in the league before moving to Manchester City in 2011. 21 June 1919: Admiral Ludwig von Reuter, fearful that the German fleet might be taken over by the British navy, which had interned it in Scapa Flow, scuttled the whole fleet. 52 vessels sank, and all but seven were eventually salvaged and the metal reused. 21 June 1951: Alan Hudson born. He was rejected Fulham after a trial as a schoolboy but then signed for Chelsea Juniors. After six years in the first team squad he moved to Stoke, and then in 1976 to Arsenal. 21 June 1958 George Swindin became manager. He was the final manager after the Shaw – Allison – Whittaker – Crayston sequence who had worked for the club in various guises before becoming manager. 21 June 1995: Dennis Bergkamp arrived from Inter where he had played just 52 league games. He had been attacked by the press in Italy where a column highlighting the worst mistake of the weekend’s games was named Bergkamp della settimana See also here. And particularly about Inter, here. 21 June 2014: Chuks Aneke left Arsenal on a free transfer to Zulte Waregem. He never played for Arsenal in the league, but subsequently played regularly for the Belgium club. 22 June 1893: The first AGM of Woolwich Arsenal was held under the chairmanship of Jack Humble; as the club’s first directors were elected ahead of entry into the Football League for the first time. 22 June 1900: Frederick Coles joined from Nottingham Forest. Little is known of his pre-Arsenal life but he is recorded as having also played for Notts County and Nottingham Post Office, probably the only Arsenal man to have done so. 22 June 1901: George Lawrence, benefactor extraordinaire to the Woolwich Arsenal, and the club’s very first historian, died of a heart attack. He is one of the men, without whom there would have been no Arsenal. 22 June 1904: James Henry Bigden joined Arsenal from West Ham. He was a local lad, and having been a near ever-present player over two seasons there was considerable upset in West Ham as he and other key players moved. 22 June 1911: The coronation of George V.
22 June 1921: The King opened the new Parliament of N Ireland, and three days later the months of drought ended with heavy rain. Two days after that the coal strike ended. The mood of the country lifted. 22 June 1922: There was outrage as it became known that Irish Republican Army activists had killed Field Marshal Sir Henry Wilson MP (a leading opponent of the separation of Ireland into two states) at the front door of his house in Belgravia. 22 June 1925: Herbert Chapman took up the job of Secretary Manager of Arsenal FC. It was a moment of supreme importance within the club, ranking alongside the move to professionalism in 1891, the application to join the League in 1893, the rescue of the club by Henry Norris in 1910 and the move to Highbury in 1913. 22 June 1983: Arsenal signed Charlie Nicholas. He played 84 times for Celtic scoring 48 goals and when Terry Neill wrote his autobiography he made the signing of Charlie the first chapter of his book. In December 1983 Terry Neill was sacked. 22 June 1988: Graham Rix transferred to Caen, followed by Le Havre and Dundee. He retired in 1993 from playing, went to Chelsea where he became youth team coach, and also played once in an end of season game in 1995 against Arsenal. 22 June 1998: David Seaman and Tony Adams played in England 1 Romania 2 in the World Cup Finals in France. Only Sherringham in the England team was older than the Arsenal pair. 22 June 2000: Nigel Winterburn, a member of the most famous defences in football history, joined WHU on a free transfer (also reported as 23 June). Since retiring he has done some work as a defensive coach and some media work. 23 June 1914: The RAF was established. 23 June 1953: Alf Haynes died. He played 29 games as a centre half under Herbert Chapman. Later he ran a newsagents in Oxford and wrote a sports column for the local newspaper and kept his connections with Arsenal under Whittaker, acting as a scout. 23 June 1971: Ex Arsenal man Jimmy Bloomfield became manager of Leicester. After that he went to Orient, and led them to an FA Cup semi-final at Arsenal and later managed Luton, before his tragically early death from cancer. 23 June 1976: Patrick Vieira born in Dakar, Senegal. Qualifying for French citizenship he played for Cannes, and made two appearances for Milan before they unexpectedly released him, and Mr Wenger bought him, while he was still managing in Japan. 23 June 1953: Death of Alf Haynes. After ending his playing career he had become a scout and had among other things recommended Cliff Holton to Arsenal. 23 June 1955: David Price born in Surrey. He joined Arsenal in 1970 and made his first team début aged 17 in an end-of-season game against Leeds. 23 June 2016: After rumours that Arsenal had tried to sign Vardy from Leicester the club and player admitted that he had signed a new contract. 25 June 1904: Fred Coles transferred to Grimsby. He later became a cricket and football coach in Sweden and was also trainer of Hague in Holland between 1910 and 1911. 25 June 1910: Sidney Cartwright born. signed for Arsenal as an amateur in April 1931 and as a professional on 9 May. He made his debut on 22 Feb 1936 against Portsmouth. 25 June 1914: Henry Norris was adopted as one of two Conservative Party candidates to contest the parliamentary seats in Stockport both strongly held by the Liberals. He did not fight the seat however as he was subsequently offer the chance to fight the seat in Fulham. 25 June 1960: Death of Charlie Buchan aged 68. After retiring from playing he became a football journalist, wrote a coaching manual and was a commentator for the BBC. He co-founded the Football Writers’ Association, and edited Charles Buchan’s Football Monthly. See also Buchan’s first period at Arsenal. 25 June 1975: Steve Gatting signed as apprentice professional. He became a professional two years later and played his first game with the first team as a sub versus Lokomotiv Leipzig on September 13, 1978 which Arsenal won 3-0. 25 June 1982: Pat Jennings played as N Ireland beat the hosts Spain in the World Cup 1-0. In all he played 119 games for the Province. 25 June 1997: Arsene Wenger signed Manu Petit for the second time. He had signed him originally in 1988 from ES Arques-la-Bataille and now, this time from Monaco for £2.5m. Luis Boa Morte also signed on this day. 26 June 1875: Ly Burrows born in Northumberland. He played in Glasgow and Sheffield, before playing for Woolwich Polytechnic while a student there and was given his chance with Arsenal while still only 16 in January 1892. 26 June 1939: Wilf Wash sold to Derby. He had spent two years at Margate before making his three league appearances as a forward, but was not considered up to the standard required and was transferred shortly before the outbreak of war. 26 June 2012: Olivier Giroud agreed to join Arsenal. 26 June 1970: Ex-Arsenal captain Terry Neill joined Hull as player manager. He was at the 2014 FA Cup final between Arsenal and Hull as a man with connections with both sides and gave a half-time interview pitchside which he hopefully subsequently regretted. 26 June 1972: Frank Stapleton signed from school as an apprentice (having tried his hand first with Man U) and played his first game in 1975 against Leicester in a 1-1 home draw. It was Mee’s last season and Arsenal finished 17th in the league. 26 June 1987: Samir Nasri born in Marseille and joined Olympique de Marseille aged nine, spending seven years in the youth academy at La Commanderie. 26 June 1998: Gavin McGowan sold to Luton Town, having played seven times. His league career was cut short by injury and he moved on to play non-league football before retiring aged 25 to become a sports teacher. 26 June 1998: David Seaman and Tony Adams played for England in the World Cup v Colombia. England won 2-0 with goals from Anderton and Beckham. 26 June 2014: With additional funds pouring into the club Arsenal announced its biggest clear outs of all time with 11 players leaving the club on 30 June as their contracts expired. Denilson, Arshavin and Sanchez Watt were among those leaving. Sagna spoke on TalkSport claiming he was not leaving Arsenal for the money. 27 June 1908: James Bigden sold to Bury after making 75 appearances in the league and 12 in the Cup for Woolwich Arsenal across four seasons. 27 June 1910: Athletic News carried an article saying Woolwich Arsenal did not yet have a full squad of players, and although this was not a total disaster (since pre-season training did not start until August) it meant that many of the most promising young players who might be available were being signed elsewhere. 27 June 1913: At the Fulham FC AGM on the shareholders passed a resolution to go to the Football League asking that Hall and Norris, now both directors at Woolwich Arsenal should be allowed to continue to serve as directors at Fulham. The League agreed. 27 June 1914: Archduke Ferdinand von Hapsburg and his wife were shot dead by a Serbian nationalist in a Sarajevo side-street after their driver had taken a wrong turning. 27 June 1919: The London Combination held a meeting to ratify the decision to make the Combination the new reserve league. This was a direct challenge to the reserve leagues that had existed before the war – the South Eastern League and the London League. 27 June 1932: Ernest Tuckett joined Arsenal as an amateur at the age of 18. He first hit the headlines with six goals in a London Midweek League match in 1933 and then moved on to the nursery club Margate between 1934 and 1936 become a professional for Arsenal in 1936. 27 June 1978: Paul Davis joined Arsenal as a professional. He had signed for Arsenal in 1977, and played for the first team for the first time against Tottenham on April 7 1980 at Tottenham. We won 2-1. 27 June 1999: Silvinho signed for Arsenal from Corinthians of Sao Paulo for £4m (also quoted as 30 June 1999 in some places). He had played 136 times for them, before moving to Arsenal where he played 55 games across two seasons. 27 June 2002: Arsenal played a pre-season friendly against Rapid Vienna, but the game was abandoned after the home crowd threw flares and stewards moved into the crowd. After the game was restarted both sides colluded to get the ball down the far end of the ground away from the fighting. The ref then blew and the players ran for the changing rooms. 27 June 2005: Stuart Taylor sold to Aston Villa, one week before Vito Mannone arrived. In all he had made 30 appearances in all competitions winning a league title, an FA Cup winner’s medal and two Charity Shield winners’ medals. 27 June 2005: Alex Hleb signed for Arsenal. Like many before and after him he was subsequently seduced and then abandoned by Barcelona – a move he described as the greatest mistake of his life. 28 June 1913: Arsenal gained possession of the Gillespie Road site for the first time thus leaving them just 10 weeks before the first match of the season to make the ground ready. There is no record of the club making any arrangements to have matches played elsewhere in the event of the ground not being ready. 28 June 1913: Joseph Lievesley signed from Sheffield Utd who had bought him after having been beaten by Southern League Swindon, for whom he played. Swindon’s victory in 1908 was one of the great cup shocks of the era; Lievesley went on to play in the FA’s tour of South Africa in 1910. 28 June 1919: Five years to the day after the assassination of Archduke Franz Ferdinand the Treaty of Versailles was signed, finally confirming the end of hostilities. 28 June 1921: Reg Boreham joined Arsenal from Wycombe. Although Bernard Joy said of him “His sparkling displays nearly gave him an England professional cap as well as amateur ones,” we know little of him save for the fact that he played 53 games and scored 18 goals for Arsenal. See also here. 28 June 1922: Archie Roe signed from Castleford Town; one of eight players who made his first appearance for Arsenal in the 1922/3 season. However he only had four games for Arsenal before moving on. 28 June 1923: Harry Woods joined Arsenal from Newcastle U. He served his country in the Tank Corps in France during the war, and then played for South Shields before moving to Newcastle United in January 1922 for £2600 – a fee that for a few months was the world record. 28 June 1928: John “Alex” Mackie transferred to Portsmouth for whom he made 257 appearances over seven seasons, including playing in the FA Cup finals of 1929 and 1934. 28 June 1929: Stan Charlton born in Exeter. His father played for Exeter and Crystal Palace while Stan junior started his career with Bromley, moved to Leyton Orient in 1952, then Arsenal and played 80 league games for the club. 28 June 1998: France v Paraguay. Manu Petit played in first ever “golden goal” game in the world cup. It was an experiment that was quickly abandoned. 28 June 2000: Davor Suker joined WHU on a free transfer. He later moved to 1860 Munich, and later became president of the Croatian Football Federation and worked as a football agent. 28 June 2013: Sanchez Watt joined Colchester after a period on loan. It was the last of six loan deals during his time at Arsenal and he went on to be a regular player for Colchester. 29 June 1900: Loughboro FC, the team against whom Arsenal had their largest league victory, finally folded. They had been in serious financial difficulty for some time and Arsenal had paid their train fares so they could complete their final visit to Plumstead. 29 June 1914: The international exhibition opened at the “White City”. It closed on the declaration of war and the site was used as a armaments depot. 29 June 1971: Don Howe left Arsenal having helped guide the club to the Double as first team coach. He moved on to WBA where he stayed until 1975 before a year at Galatasaray SK after which he returned to Arsenal as manager. 29 June 2015: After much expectation, Arsenal purchased Petr Cech from Chelsea for around £10m. It was reported that the Chelsea manager Mourinho was particularly unhappy about the sale. 30 June 1884: Tower Bridge was opened. It was the furthest easterly bridge over the Thames until the opening of the Queen Elizabeth II bridge at Dartford. 30 June 1905: The Kentish Independent published a list of season ticket prices at Woolwich Arsenal – showing a price of £2 2s – about two thirds of the weekly wage of a skilled artisan. At same time Woolwich Gazette revealed that Arsenal did not run the bars in the Manor Ground but leased them to others. 30 June 1914: Steve Stonley transferred to Brentford. He scored 13 goals in 28 league games in 1913/14, but left for Southern League Brentford after Harry King was signed. 30 June 1915: The 177th (Fulham) Royal Field Artillery Brigade which was raised and paid for by Henry Norris had by this day recruited everyone it needed apart from the hard to find skilled metal workers who maintained the guns in the field. He was immediately asked to raise a second artillery brigade and subsequently went on to raise a third. They were billeted in Fulham Town Hall, something Norris forgot to reveal to the council! 30 June 1932: Derek Tapscott born in Barry. He was one of 16 children, After leaving school at 14 he worked as a delivery boy, TV repairman’s assistant and bricklayer, before serving with the Royal Engineers. He was signed by Arsenal in 1953. 30 June 1975: Rami Shaaban born in Stockholm of Egyptian and Finnish parents.He started at Saltsjöbadens IF before playing in Cairo while also studying at university. He later moved to Djurgården and in August 2002 to Arsenal. 30 June 1995: Kevin Campbell transferred to Nottingham Forest who were European Champions. However the side were relegated and then promoted during his time there. 30 June 1999: Michael Black given a free transfer. He had signed as a pro for Arsenal in July 1995 having won the Youth Cup in 1994 and played his one and only game for the club as a sub in the Champions League match away to Panathinaikos in December 1998. Subsequently he played for Millwall, Tranmere, Southend, and then for a wide variety of non-league clubs. 30 June 2009: Amaury Bischoff and Rui Fonte left Arsenal while Luke Ayling, Craig Eastmond, Cedric Evina signed pro forms. Bischoff was signed as “a gamble” because of his injury record and only made 1 appearance. Rui Fonte did not make the first team appearance and signed for Sporting Lisbon but didn’t sign for them either. 30 June 2009: Craig Eastmond signed pro forms, and went on to make 10 first-team appearances for Arsenal before being loaned to Colchester Utd on 27 September 2012. 30 June 2010: Luke Ayling transferred to Yeovil one year after signing professional forms with Arsenal. After 162 games for Yeovil he moved on to Bristol City and won League One with them in 2014. 30 June 2010: Kerrea Gilbert transferred to Portland Timbers. He was unable to obtain a visa to play in the US however, and ultimately signed for Yeovil and played for them 8 times. He subsequently played for Shamrock Rovers, Maidenhead and St Albans City. 30 June 2010: Jens Lehmann, the only goalkeeper ever to go 42 games in a 1st Division or Premier League season unbeaten, retired as a player. Although he did make a comeback – by chance. 30 June 2010: Jérémie Aliadière’s contract at Arsenal ended and he left as a free agent, but injured himself in pre-season training, and was left without a club and without being able to play. 30 June 2012: Manuel Almunia at the age of 35 was released by Arsenal and moved on first to West Ham and then to Watford for whom he played 76 league games in two seasons. His transfer is also reported as 30 July. 30 June 2013: Andrey Arshavin released and transferred to Zenit for whom he had been on loan in 2011/12. 30 June 2014: Park Chu Young left Arsenal after just seven games in three years. His transfer was one of the strangest in the history of the club and appeared to have as much to do with passport requirements as anything else. 30 June 2017: Arsenal’s loan of Calum Chambers to Middlesbrough and Jack Wilshere to Bournemouth officially came to an end and the players joined the first team squad at Arsenal. Note: The anniversary file pages have over time been split and split again as they have grown. Please use the index below to find the month you want.